I am obsessed with Sole Society right now, thus I shall blog about it. Readers, I promise I own others shoes as well! Figure 1. 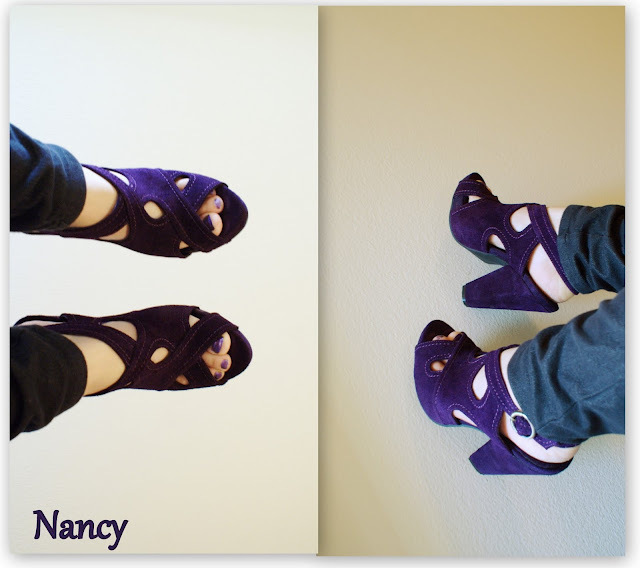 Nancy in purple -- genuine suede sandals, 5" heels with 0.5" platform. Figure 2. 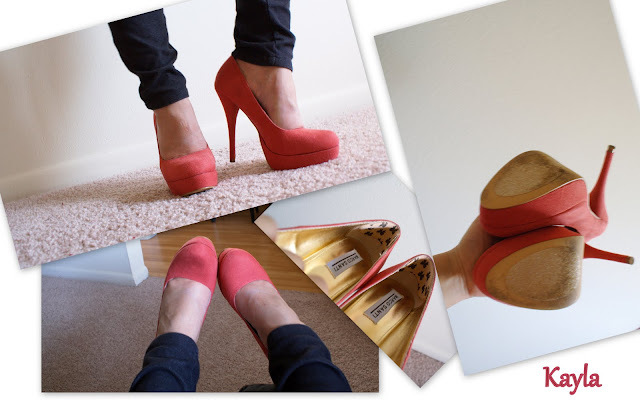 Kayla platform pumps in coral -- microsuede, 5.25" heels with 1.25" platform. If you get Kayla or Nancy (or Karla), be sure to put sole protectors on them prior to wearing them out. Otherwise, you may damage the soft soles. The shoes I've purchased this month already have sole improvements, so SS is listening to their customers! I also had to put in heel grips for my Kaylas because when I first got them, they were slightly tight but have loosen up enough that my heels slip out of them (this is normal for me). You may not be able to tell, but the heel grips have little black bows on them (even though they kinda look like little black bats...). They are made by Fab Feet, you can find them at Target. I think Fab Feet is from the same makers of Foot Petals but Fab Feet is a lot cheaper, and IMO, of similar quality. For Nancy, I had to go up a 1/2 size and I put inserts at the balls of my feet because the shoes are preeeety steep. Nancy is already pretty comfortable but with the inserts, I can walk faster and longer in them. OK, that's all for now! Bye! My Kayla shoes are fine. My Nancy shoes, however, are a bit dented even though I have protectors on them, and I've only worn them out twice. Maybe it's just how one wears their shoes? Noooo! Nancy in purple is even prettier than on the website! I've spent way too much on shoes this month, but I really want them. All those promo codes floating around are really tempting me too.